One of the most pressing questions facing the remodeling industry today is: “Where will we find the next generation of contractors, skilled laborers, tradespeople and craftsmen?” Many of our local members are reporting that the skilled labor shortage is causing a backlog of work and homeowners in the Charlotte Metro area are having to wait longer to get projects designed, priced, permitted and the first nails pulled on their projects. NARI Charlotte is actively involved in developing and implementing a multi-pronged approach to help solve this growing problem. Understanding how we got into this mess is the first step towards crawling out of it. When the 2008 recession hit, many skilled workers were unable to find jobs and dropped out of the industry – never to return. Compounding this problem, a whole generation of younger workers are not even considering construction as a viable career option. For decades, high schools phased out shop classes, and parents have steered graduates to four-year colleges and white-collar careers despite the staggering costs of higher education. Too many high school guidance counselors are still beating the college drum with no warning about the astronomical debt many students will have strapped to their backs if, and when, they graduate with a four-year degree. Meanwhile, older skilled trade workers are retiring and there simply aren’t enough people with the knowledge and experience to take their spots. A recently released survey by the Associated General Contractors of America (AGC) revealed that nearly 80 percent of construction businesses are having a hard time finding qualified skilled labor. A recently released survey by the National Association of Home Builders (NAHB) revealed that 69 percent of its members were experiencing delays in completing projects on time due to a shortage of qualified workers. A recently released survey by the National Association of the Remodeling Industry (NARI) revealed that labor shortages impacted 70% of members. Not only are projects taking longer to complete but wages for skilled trades are increasing which means project costs are going up. NARI Charlotte is on a mission to make the remodeling industry more attractive to kids starting as early as middle school. The prevailing notion in our society that a 4-year college degree is the “only” path to success has led to the “diploma dilemma” where we have millions of college graduates unable to get jobs with their chosen path of study while millions more skilled labor positions go unfilled. Something’s got to give. NARI Charlotte is on the front lines of the fight for change. The solutions include not only encouraging more young people, women and veterans to join the honorable ranks of the skilled trades – we are pouring our time and resources into changing the image of construction as a low-paying, blue collar, no-respect industry. This is simply not true! The opportunities are endless for people who are interested in solving problems and learning how to work smarter, not harder. Let’s face it – not everyone wants to sit in a cubicle all day pushing papers. There’s something fulfilling about helping people improve their homes. There’s something magical about the creative process of turning raw materials into beautiful living spaces that will be enjoyed for generations. It takes design expertise, people skills, and craftsmanship which is often taught, not in a classroom, but out in the field. So, back to what NARI Charlotte is doing about the skilled trade crisis. For the past six years, we’ve partnered with a local Home Builders Association to host a masonry and carpentry contest for high school students. NARI Charlotte provides tools, prizes, financial support and branding to encourage sponsors to host these events. Dozens of students have participated over the years from nine local schools. These students represent three counties and Lowe's is our major sponsor, as well as host, for the competition. In addition to the masonry / carpentry competition, our chapter has hosted two Design / Build contests for local kids interested in design and construction. We invited student teams to flex their creative and construction muscles in the “Parade of Playhomes” event. The students were tasked with designing and building a playhouse which was raffled off for charity. Two local schools included this project in their summer construction camp and the real benefit for the kids was that they learned “soft” skills for success in life – and in the workforce - like showing up on time, navigating a plan, and working together as a team. Our chapter also supports the local Skills USA competition and our winners have gone on to win state and national championships. Skills USA competitions give young people an opportunity to show off their skills in a variety of construction arenas including cabinetmaking, carpentry, electrical wiring, masonry, plumbing and more. We continue to support this event and have hosted several national champions, and even one world champion! 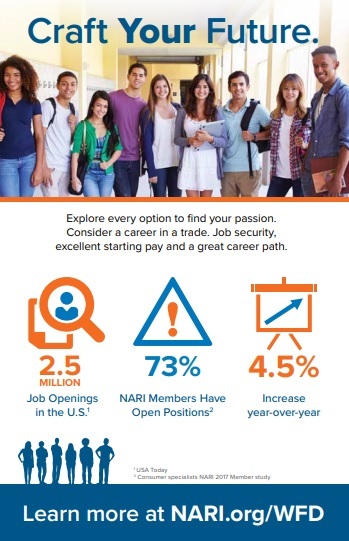 NARI Charlotte offers three local scholarships to NARI members, employees and family members for those interested in pursuing the trades. 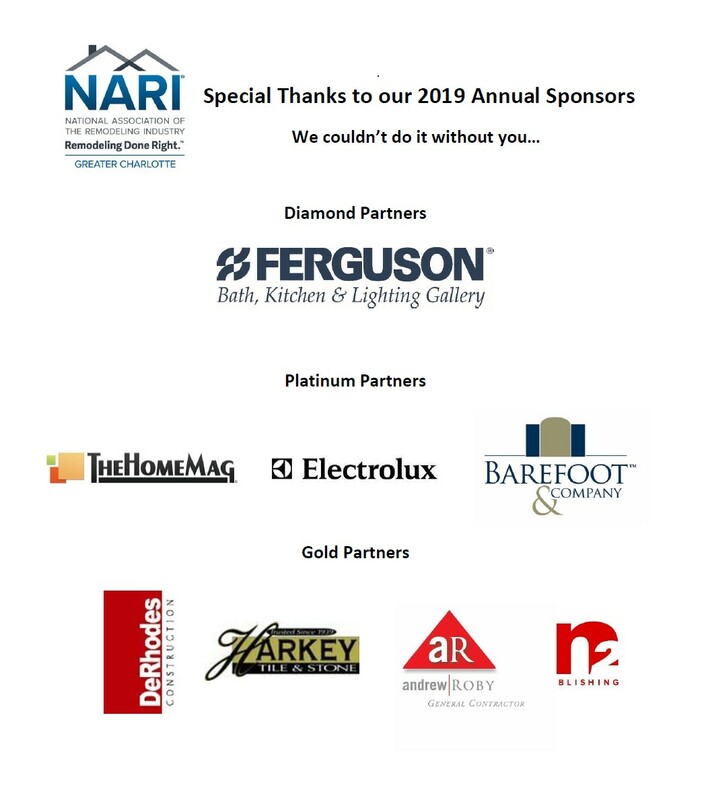 NARI Charlotte has also sponsored the local Women in Construction scholarship fundraiser to give two local female students scholarship funds to follow their dreams of entering college-level construction programs. Our chapter founded a Boy Scouts of America Skilled Trades Exploring Post. This gives our local members an opportunity to work directly with kids in middle and high school – with hands-on learning sessions that touch on all aspects of the remodeling industry from design to construction to business ownership skills for the budding entrepreneur. We are very excited about the growth potential for our post and encourage our members to volunteer to share their expertise with the kids. You can be part of the solution! We are thankful to be able to support a brand-new trade school in Charlotte, NC – The ROC – which stands for Rebuilding Opportunities in Construction. The mission of The ROC is to recruit, educate and mentor high school students in Charlotte, NC for Career and Technical Education (CTE) and employment opportunities in the construction industry. NARI Charlotte is an active advocate for the school. Our local Board of Directors is committed to capturing the attention of kids early and showing them the opportunities waiting for them in the remodeling industry. One of the best ways to do this is through the local school systems. Several of our board members have carried the NARI Charlotte banner to local classrooms in Mecklenburg and Union County. We promote the future of the construction industry at the Charlotte Mecklenburg Schools Career Discovery days and we have representation on the Union County Public Schools Construction Trades Advisory Committee meeting. NARI Charlotte is fortunate to have the star of the DIY Network’s “Rescue Renovation”, Kayleen McCabe, as a cheerleader for our industry and our local chapter. Kayleen’s high-energy enthusiasm for the remodeling industry is infectious. She is an ardent advocate of trade careers and education. Her goal is to shed light on the rising demand for trade professionals – and to help restore America’s respect for the trades in the process. She travels the country talking to young people about her unconventional journey as a female in the remodeling business and how her love of woodworking started as a hobby and turned into a successful career. She’s a hammer-swinging veteran of the construction industry with great stories to tell so don’t miss meeting her at one of our monthly dinner meetings. Wondering how you can get involved in helping to solve the skilled trade crisis? Don’t underestimate the impact you can make. We need your help! Email our Executive Director, Mike Waite, to find out how to best use your skills, experience and knowledge to make a real difference.